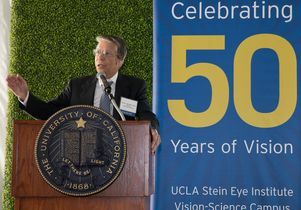 The UCLA Stein Eye Institute marked its 50th anniversary and the reopening of the Jules Stein Building, recently renovated to create a state-of-the-art facility to advance UCLA’s work in the field of ophthalmology. The expanded facilities enable UCLA to broaden research and provide exemplary care for patients in the treatment of eye disease. The renovated Jules Stein Building features two floors of new modular laboratories, which can expand and contract for researchers, as funding needs change. The comprehensive ophthalmology and glaucoma areas have been redesigned, as has the Center for Community Outreach and Policy. And urgent care is now a separate unit. The renovation will help the institute continue delivering cutting-edge clinical care, said Dr. Bartly Mondino, director of the UCLA Stein Eye Institute for the past 23 years. “More space allows us to create revolutionary, new programs in treating eye disease, using techniques such as stem cells, gene therapy and even ‘big data,’ to help us gain a 360-degree view of a patient’s health problems, leading to new findings, novel treatment plans and more accurate diagnosis,” said Mondino, who’s also chairman of the department of ophthalmology at the David Geffen School of Medicine. 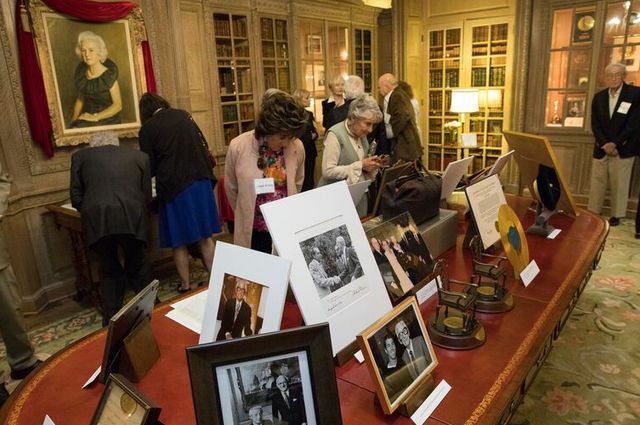 Reed Hutchinson/UCLA - In the reading room of the Jules Stein Building, guests attending a celebration of the 50th anniversary of the UCLA Stein Eye Institute look over photographs tracing its history. A portrait of Mrs. Doris Stein hangs in the room. The renovated Jules Stein Building, designed by architect Jeffrey Stenfors, features a spacious atrium entrance that illuminates the first three floors. Like the Edie & Lew Wasserman Building, the Jules Stein Building utilizes more glass and light. The redesigned building, which is LEED-certified, also was seismically upgraded. The approximately $65 million, 108,000 square-foot project was funded in large part by gifts from donors. UCLA’s research and clinical work in the field of ophthalmology have grown rapidly during the past five decades. Ophthalmic surgeries have increased from 1,827 surgeries in 1969 to 19,000 in 2016. This past year, 230,000 patients visited the department, up from 23,000 in 1969. The UCLA Mobile Eye Clinic, which has operated for more than 40 years, has provided free care to more than 300,000 underserved children and adults over the course of its operations.